How Far Back Does My Free-Black Heritage Go? The farthest I’ve been able to trace my family history in Ohio is back to my fifth great-grandparents William H. Kinney and Henrietta Mason. I know that they were in Ohio before 1840, and since they showed up so early in census records, I wondered if they were born free. All of the records that I’ve found on them show that they were originally from Virginia, with William born about 1807 and Henrietta born about 1808. One day I ran a search for “free blacks William Kinney 1807,” and a link to the book Free African Americans of North Carolina, Virginia and South Carolina, Volume 2 popped up. The page listed a woman named Milly Kinney who was born free about 1777. She registered her seven children, and one of them was a boy named William, who was born about 1810, which is not far off from 1807. I found William and his family living next door to Milly on the 1830 census in Augusta County, Va. They were also living close to a white family named Kinney, so I don’t know if there’s any connection. Our research indicates that you have good reason to believe that you have had free black ancestors since the late 18th century. As Professor Gates previously wrote in The Root, by the 1860 census, nearly 1 in 10 African Americans were free, more than half of them living in Southern states like Virginia, where you suspect that William H. Kinney was born around 1807. So whether they lived in the North or South, the status of free black people was far from secure. This is clear to anyone who knows the story of Solomon Northup, the free black New Yorker whose kidnapping into slavery was chronicled in his own narrative and later depicted in the 2013 film 12 Years a Slave. FamilySearch explains one way the problem was addressed in its wiki on “African American Land and Property”: “Most free African Americans carried their own papers, but these could be stolen. In order to distinguish between slaves, runaways, and free African Americans, many counties or states in the upper South, and border states kept one or more sets of registers or papers. Some had registers of slaves. Some kept registers of blacks, freedmen, ‘free men of color,’ or ‘free negroes.’ Some kept copies of manumission papers of people freed from enslavement.” Such a register supplied some of the source information you found in Free African Americans of North Carolina, Virginia and South Carolina, by Paul Heinegg. Based on that and the records you located so far, it seems very likely that your William H. Kinney was the son of Milly Kinney of Augusta County, Va. Starting with the record of William and Henrietta in Buckskin, Ross County, Ohio, in 1850, you can establish that both were born in Virginia about 1807 and 1808, respectively. This record also provides you with information on several of their children, starting with their eldest, Nancey (age 23), and seven others, which you can use to compare with other records. For instance, William had sons named Isaac and John, and those were the names of two individuals who may be related to Milly Kinney, according to Free African Americans of North Carolina, Virginia and South Carolina. As you mentioned in your question, you know that William Kinney and Henrietta were recorded in the 1840 census in Twin, Ross County, Ohio. These 1850 and 1840 census records together can help you fill in the number of children the couple had in total. You know that the male between the ages of 24 and 35 is William and that the woman in the same age bracket is Henrietta. This record also includes a daughter between the ages of 10 and 24 (likely Nancey); three daughters under age 10 (likely Martha, Julian and Harriet, if her age was recorded incorrectly in 1850, or perhaps an unknown daughter who passed away before 1850); and three sons under age 10 (likely Isaac, John and William). Using this information, you know you are looking for a record of the family in 1830 with at least one daughter (Nancey) who survived to 1850. You located a William Kinney in the 1830 census living in Augusta County, Va., directly next to Milly Kinney, who you suspect may be his mother. If you examine the original record closely, you will note that William’s household included William, in the 24-36 age bracket; his wife, between the ages of 10 and 24; and a daughter and son, both under the age of 10. The daughter is a good match for Nancey Kinney, who was still in their household in 1850. The son is a mystery, since he does not appear to be accounted for in the other census records for the family. It is possible that he died before 1840 and was not recorded with the family. You’ll also note at the top of the 1830 census record that it was enumerated in Staunton, Augusta, Va., the same location where you told us you located a marriage record for William Kinney and Ritter Mason on Nov. 29, 1827. Not all records recorded an individual’s race, so just because the record does not state that they were people of color does not mean that this is not a record for the right people. Plus, “Ritter” is likely a variation on “Henrietta.” All of these records together make a strong case that they are for the same people. 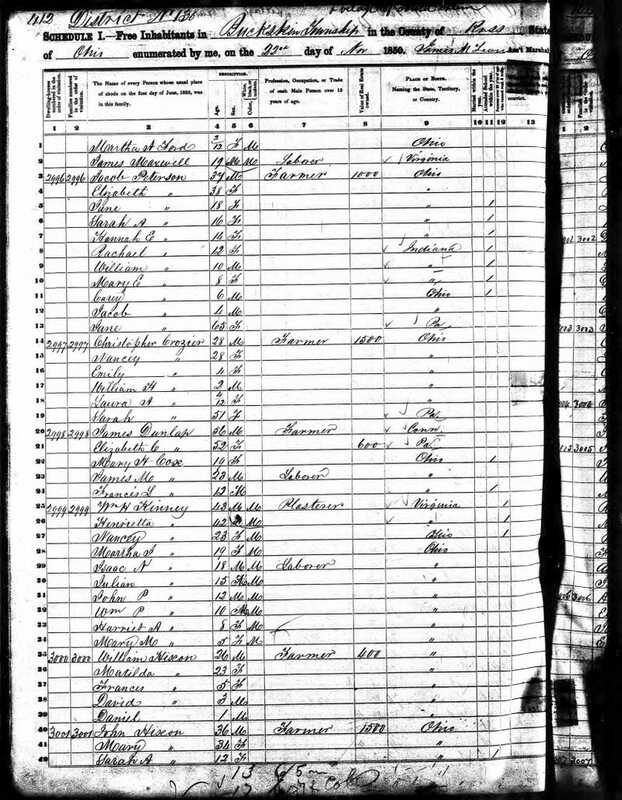 Pay attention to Milly Kinney’s household in the 1830 census record, too. It includes Milly, between 36 and 55 years of age, and three other females: two between the ages of 10 and 24, and one under age 10. This is a good match for the information that you located on Milly Kinney in Free African Americans of North Carolina, Virginia and South Carolina. There she had only one son, William, and the rest were daughters. It is always a good idea to go back as close to the original source of information as possible. Paul Heinegg cites the information on the Kinney family from the collection “Register of Free Blacks, Augusta County, Virginia, 1803-1845,” register No. 38, which is available on the Valley of the Shadow webpage. The record describes Milly Kinney as “a dark coloured negroe, about Five feet five of six Inches high, aged about Forty five years; a small scar in her forehead and Born free,” who registered with her children in 1822. That would date her free status to her birth circa 1777, during the Revolutionary War, as you surmised. Examining the full transcription, you will note that Nichs C. Kinney was the witness to Milly’s registration. A white man named Nicholas C. Kinney was recorded in the 1830 census also residing in Augusta County (as was a white man named William Kinney). The relationship between him and Milly Kinney is worth exploring. One method you could take to confirm that this is the family of your ancestor William Kinney would be to see if you can match any names of children in the register with his siblings. A challenge you will have in this regard is that based on the register, William Kinney only had sisters, which means that they could have married and changed their surname before they showed up in census records. In fact, there is a note on the free-black register that states that Mary Kinney renewed her registration on June 7, 1842, when she was about 35 years old. This suggests that William’s sister Mary Kinney was not yet married and was still using the Kinney name in Augusta County in 1842. It also suggests that the other daughters had either left the area, were married and changed their names, or were deceased by this date, since they did not also register. With that in mind, a search strategy we used was to search for individuals with the sisters’ first names who were born about the right time in Virginia and were living in Ohio. Interestingly, we had some positive results. In 1850 a Jane Acres, a mulatto woman born about 1810 in Virginia, was residing with her husband, John Acres, in Scioto, Ross County, Ohio. This is the same county where your William Kinney resided, just a town away. There was also a woman named Mary Cloude, born about 1800 in Virginia, also residing in Scioto the same year. It seems possible that these two women could be the sisters of William Kinney who were named in the 1822 registration in Augusta County. There were not many free blacks living in Ross County at this time who were born in Virginia, so chances are they could have been associated with each other in some way and traveled to the state together. Also keep in mind the laws at the time. It is likely that once the Kinney family moved to Ohio, they would have had to register in that state as well. The Family History Library holds a microfilm collection for Ross County, “Record of Negros, 1804-1855.” This collection includes manumissions and also certifications for free blacks. It seems likely that it will include the certificates for your Kinney family, as well as any of these other families who may be associated with yours. You could view the film at a local Family History Center to see if the records include any further information about where the family previously resided or any of their relatives. Likewise, you could also check court records to see if the family ever had to defend their freedom, which may include more details about whether or not they were born free. You could also search for land records in Ross County to determine whether your Kinney family ever owned land and, if so, from whom they purchased it. Sometimes individuals purchased property from people they already knew who were helping them get started in a new place. Such records may provide you with another name to try to connect back to Augusta County, Va. The indexes for land records in Ross County, Ohio, are available to browse online, but you will need to order the record on microfilm. As we searched the index for the Kinney surname, we noted that a Nicholas C. Kinney sold property in Ross County on April 29, 1843. We could not locate a Nicholas C. Kinney residing in Ross County in either 1840 or 1850, but it is possible that this is the same Nicholas C. Kinney in Augusta County, Va., and that he owned property in Ohio but did not reside there. Examining the originals of these records and locating more records for Nicholas may help you determine whether there was more of a connection between your Kinney family and Nicholas C. Kinney. Perhaps Nicholas C. Kinney provided land for your William Kinney and his family in Ohio or helped him get established there in some other way. Paul Heinegg had not connected Milly Kinney to the other Kinney family he described, listing her under “Other members of the Kinney Family,” meaning that he did not locate evidence that she was also a descendant of the slaves owned by the Johnson family. Perhaps she adopted the Kinney name because of a connection to one of the white Kinney families in the area, particularly Nicholas C. Kinney, who seems to have had ties to both places where the family resided. Further research on him may help you prove definitively the connection to Milly Kinney.